Erika's Bed & Breakfast01328 863058work Guest AccommodationA warm welcome awaits you at Erika's Bed & Breakfast, a modern house on a private road, 2 minutes walk from the town centre. We offer 6 en-suite bedrooms. Two of these are single, two are twins and two are family rooms. All of our rooms come with TV, tea and coffee making facilities and everything that you need for a relaxing getaway. The accommodation and location make it an ideal place for couples and families alike. 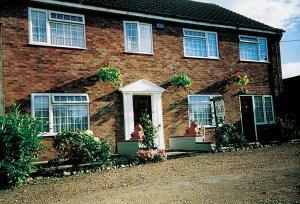 Set in the market town of Fakenham it is ideally placed for exploring the beautiful Norfolk coast and Norfolk Broads. Nearby is the quaint market town of Holt where you can enjoy a wander around its pretty streets and shops before enjoying refreshment in one of its many cafes. A 20 minute drive takes you to King's Lynn with its fishing port and museum. Norwich is around 35 minutes drive away where you can find many shops and attractions, including a Castle Museum and Cathedral. Fakenham itself offers a variety of shops, pubs and restaurants and a cinema. There is also a bowling alley with a mega fun for our smaller guests. Thursday is Fakenham's market day. We believe that we provide an excellent service to our guests and this is reflected in the fact that we have many guests who return year after year. A warm welcome awaits you at Erika's Bed & Breakfast, a modern house on a private road, 2 minutes walk from the town centre. Freeview in all rooms. Cycle storage available. Children welcome from any age. From A148. From Norwich, A1067, left at traffic lights, Gladstone Road on right, opposite school. From Norwich - 20 miles, from King's Lynn - 20 miles.